Edward Meadham and Benjamin Kirchhoff; together: Meadham Kirchhoff having recently unveiled a new range for Topshop this season inspired by the Magic Roundabout (you can tell with the shoes) and of course it's new fictional girl band: The Cherry's! I was so excited when I got the email and I just had to log on and see because the idea and looked so awesome. Plus Meadham Kirchhoff just scream quirky, cool and simply outrageous. I was really impressed with the new range - it ticked all the boxes: extravagant, quirky, adventurous and very Meadham Kirchhoff, but less of the romantic darkness you usually get from Meadham Kirchhoff. But not necessarily 'me' - well all of it anyhow. The new range is separated in to four categories: Cherry Blossom, Cherry Cherie, Cherry Pikka and Cherry Satanika, all names of members of the 'Band' varying in styles and adding up to a total of 80+ pieces for the new collection. Not all of it screamed 'me' so I thought I'd show you a few of my favourites to each category of the brand! Each Cherry has a rebellious attitude and is shown through each category of the collection. The Collection wasn't just inspired by the new Glam Rock style Girl Band, but the overall aesthetic was influenced by Marilyn Manson and the Spooky Kids and Kembra Pfahler. In encompasses an array of contrasting textures; leather, lace, suede, chiffon, crochet, glitter, Mongolian shearling, pvc and angora wool. These are all brought together to work a contrasting and clashing palette to suit each Cherry. Cherry Blossom and Cherry Cherrie scream the more sweet and innocent, with Cherry Blossom's more ethereal look their almost 'girlier' overall appearance. Whereas, Cherry Satanika and Cherry Pikka have a more wicked and rebellious look with darker streak throughout; definitely reminding me more of a true Glam Rock signature. I was originally a bit skeptical about the collection, mainly because of the price, but when I noticed the pieces I liked were made out of angora wool, real suede and animal fur I was quite happy to justify the idea of buying a piece or two - or maybe some lovely relatives and friends will read this and get the hint hint for my Christmas presents! I'm not a fan of all 80+ pieces, but there is a couple I've been adding to my Christmas list, for their true Meadham Kirchhoff kitsch look, high quality and beautiful appearance. I'm definitely quite excited for this collection, but, I'm afraid the shoes are just not for me! My favourite, I think, was Cherry Pikka, 90% was just perfect for me. Maybe I've got a Cherry Pikka rebellious side to me, but it definitely had the only pair of shoes I favoured in the Collection and that lurex cardi and crochet jumper were fabulous, and two pieces that WILL be mine! 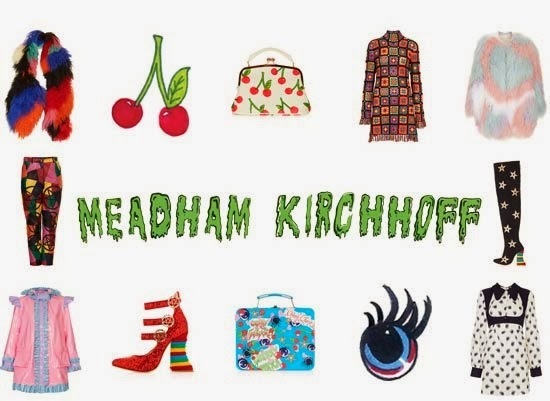 Tell me your thoughts of the new Meadham Kirchhoff Collection for Topshop? Have you got any on your Christmas list?